As customary, my two-year-old, Brooke, and I sit down with a book after lunch. One of the illustrations depicts a roomful of children (let me qualify: a roomful of unessential, unnamed, secondary-to-the-plot children), yet she wants to know everyone's names. She points to the first child. "Who's that?" I make up a name on the fly. "That's Sam." "No, it's not. Who's that?" Her finger lingers on his face. Clearly, this little boy did not look like a Sam to her. My confidence starts to wane. Miles? Charlie? Colin? Billy? Matthew? Joe? Chase? Brad? She is resolute: no. After what feels like eighty-four tries, I exhaust my readily-available repertoire of fictional character names, and that's when I think of one more. It comes out of nowhere. I am getting desperate. 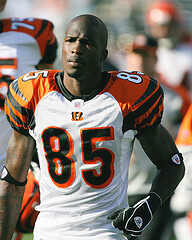 Hey, if Chad Johnson can rename himself after his jersey number, can't my two-year-old buy this? We try some more and finally reach an agreement. The boy is named Timothy. There are nine more children in the picture. On and on we go, naming each child. I offer suggestions. Brittany? Rachel? Tabatha? Chloe? Annie? Sarah? Lauren? Samantha? Jessica? Katie? Lily? She tackles and shuts down each of my suggested offerings, minus the in-your-face-while-you're-flat-on-your-back banter, of course, but the message is the same: rejected. Reading the book took longer than anticipated, but we finally make it through. And, as customary, once we finish and I gently shut the cover, Brooke opens it once more and says, "Let's read it again." I had forgotten about repeats. She places her finger on a boy's face. "Who's that?" We are right back where we started. Ha! At least she's detail oriented? That's a good thing, right? Here we come, profitable careers in neuroscience! Oh man. This is exactly why kids drive me crazy! You're great that you have so much patience. I just explain to Emma that it's only a picture and the author didn't give those faces names. It never works though. She wants to know "why?